Dylan Applegate returns serve against Tooele in Park City on Wednesday, April 3. Applegate, a new arrival to Miners boys tennis and a nationally ranked freshman, has made an immediate impact on the team. Utah’s upperclassman tennis players who are looking forward to facing a Park City freshman should do so at their own peril. Dylan Applegate, the Miners’ No. 1 singles player, is not messing around. So far, the 15-year-old Parkite has shut out both Juan Diego and Tooele’s senior No. 1 singles players, 6-0, 6-0, in the team’s two victories to start the season. And according to him, he’s just getting started. “I gain confidence from beating these older players, and it helps me,” Applegate said. The Miners standout has lived in Park City for four years after having moved around to an array of places like San Diego and his father’s native New Zealand. He takes online classes while competing on Park City’s varsity team. 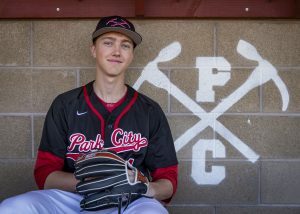 Park City boys tennis coach Dillon Bunt says having a rising star around the team environment is symbiotic. 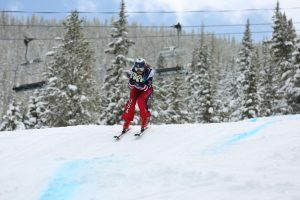 While Applegate has his eyes on a future in tennis — he said he wants to play at the University of Southern California — off the court he does a lot of the things that a teenaged Parkite does — ski, snowboard; all with friends. He aspires to entrepreneurship. As the area thaws out from wintertime, a family tradition will also return: ping pong in the garage with Ken Applegate, Dylan’s father. “At least every day we’ll be playing ping pong in the garage,” Dylan said. While it’s obviously tennis in miniature form, Dylan says the tabletop sessions do help him work on one aspect of the game that applies whether it’s on a table or on clay: the head game. “It can really help your mental game if you stay mentally tough in ping pong and in tennis,” he said. Park City boys tennis coach Dillon Bunt said that he’d known Applegate was a talented player from seeing him practice in middle school. But he hadn’t known that, in his first season coaching the Miners, he’d be able to point him at Park City’s enemies. Applegate has been in the service industry since he was 6 years old, and competing seriously since 10. Adidas lists him as a 4-star recruit and the second-ranked player in Utah overall, and he competes in national tennis tournaments yearly. While so far he has dominated his Region 11 opponents, the competition nationally is much stiffer. Tennisrecruiting.net shows his overall record at 42-24. “I’m working on serving and volleying a lot, which is a big one, and my return is a part of my game that I’m really working on to make a lot stronger,” Applegate said. High school play still presents him with some tough challenges. Down the road is a matchup with Connor Robb-Wilcox, a Skyline junior just below Applegate at No. 3 in TennisRecruiting’s Utah rankings. Bunt said reigning region champion Bonneville, where Park City will travel to on April 21, as well as Stansbury, constitute potential roadblocks for the team. 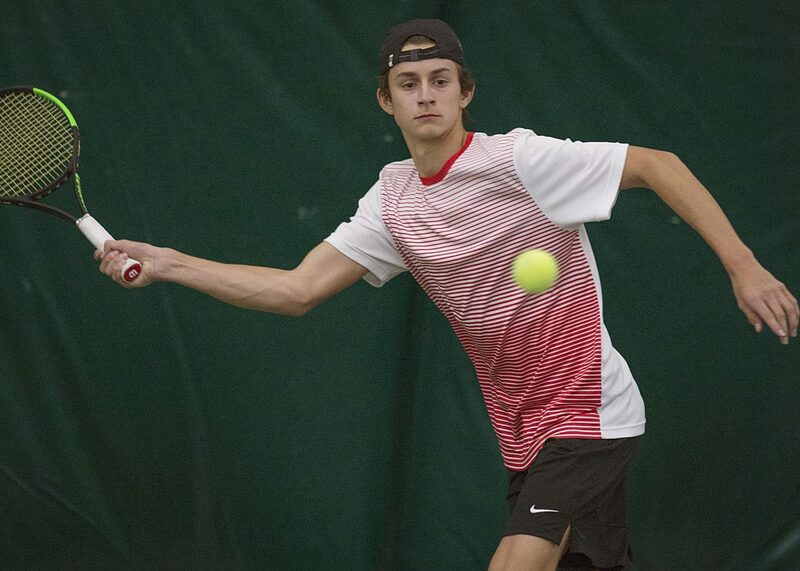 As Park City aims for a return to the state playoffs, though, the Miners’ opponents in singles play may need to accept that Applegate will be a persistent issue for them. He’s only a freshman, after all.